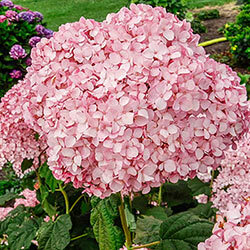 If you're thinking pink for your hydrangea display, Pinkerella is the one for you. The bright color on these blooms is second-to-none. Be sure to snip a few blooms for your fresh bouquets, strong stems hold the blooms tall, and really let them shine. This is a native cultivar, that grows quickly and easily with very clean foliage. 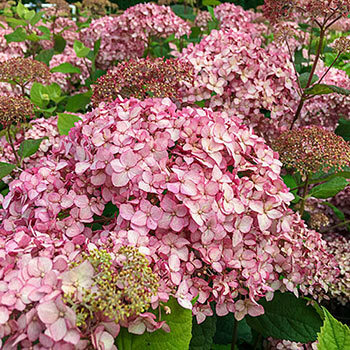 No need to deadhead, either—these blooms maintain a lovely color as they mature and even look beautiful when they dry out. In the winter garden, they'll add architectural interest in hues of wheat and tan. You should also cut some for dried arrangements—just one dried flowerhead in a vintage vase makes a charming end table accent. Pinkerella blooms on new wood. 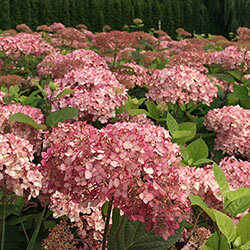 We suggest cutting back to a single set of buds in late winter or early spring. You'll have less flowers, but because energy was diverted back to the plant, the flowers will be even bigger and more impressive. Planting Instructions: Provide shelter from cold, drying winter winds. Soil Requirements: Moist well drained moderately fertile soil. Pruning: Cut back in late winter/early spring to a single set of buds. 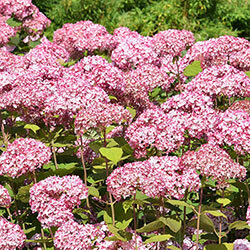 Cutting back will produce less flowers, but the flowers will be larger.